This was the deal: A West Virginia drug dealer was going to plead guilty to a single count of distributing heroin and in exchange prosecutors would drop the five other counts against him, including a couple counts of peddling highly addictive fentanyl. But when the plea agreement was presented to U.S. District Judge Joseph Goodwin, he did something neither the prosecutor nor Charles York Walker Jr.’s public defender was counting on — he said no. 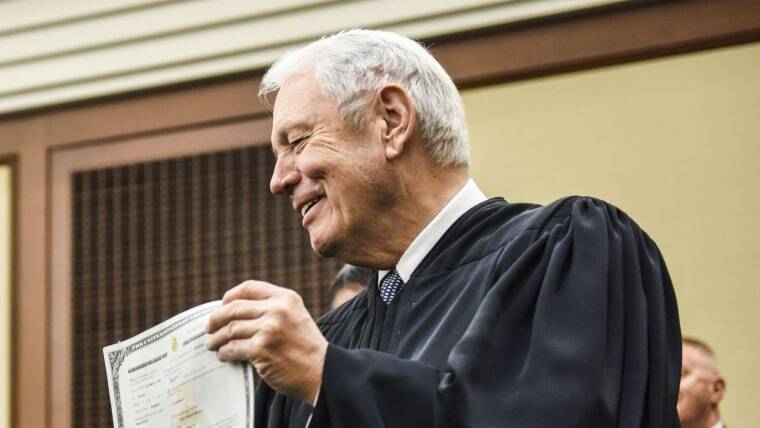 And in a 28-page order, the judge said one of the chief reasons Walker should face the “bright light of the jury trial” is because West Virginia is “ground zero” for the opioid epidemic that has been ravaging the nation. Goodwin’s ruling, which was released Monday in Charleston federal court, stunned Walker’s lawyer. “This is the first time anything like this has happened in 25 years” of practicing law, Lex Coleman told The Washington Post. Clint Carte, a prosecutor in the U.S. Attorney’s office, said this was a shocker for them too. “We believe it's the first time in recent memory that a plea deal like this has been rejected by a judge,” he told NBC News. It’s very rare that federal criminal cases — of any kind — go to trial. Last year, more than 97 percent were resolved by a plea agreement in which a defendant agreed to plead guilty to a lesser offense, thus avoiding a jury trial and guaranteeing the government a conviction, according to the U.S. Sentencing Commission. Goodwin, who was appointed to the court in 1995 by President Bill Clinton, did not return a call for comment. But in his ruling, dated June 26, he made an impassioned argument for why Walker should face trial. The judge also went to great lengths to describe the damage this epidemic had done to his home state. The judge’s claim is backed up by the most recent available statistics from the federal Centers for Disease Control and Prevention which reported that in 2015 West Virginia had the highest rate in the nation of deaths due to drug overdoses. It was 41.5 per 100,000 people. “For most of his life, Mr. Walker has been involved with illicit drugs,” Goodwin wrote. Wrapping up, Goodwin wrote that a jury trial is “fundamental to the American scheme of justice” and the plea deal offered Walker has little to do with justice.